The story of the Alteration Train – what little we know of it, at any rate – begins during one of the greatest battles of the Third War of Magic. Two vast armies faced each other in the smoldering remains of Billion Toad City, each led by a mighty sorcerer. By all accounts the events of that day were amongst the bloodiest and most terrifying in a war that had no lack of such, and the magical forces unleashed by the sorcerers were powerful and remorselessly brutal. Bodies were torn apart by the thousands as energies clashed and exploded; survivors described streets literally flowing with blood and guts. So powerful was the magic unleashed, in fact, that something entirely unexpected happened. No-one has ever been able to establish the exact nature of the phenomenon – some say it was a hole in the fabric of reality, others claim it was more akin to a gate by accident unlocked – but what is certain is that for an instant, there was an opening into some unknowable Abyss, and through it came a train. Few people ever see the Alteration Train, but all feel its passing. Often it comes at night, a deep rumbling noise washing over the horizon, but there is no time when it does not come. Though it drives on tracks, it leaves none behind. As for its appearance, it is never quite the same, changing from land to land and person to person. To one it might appear mighty and black, to others dainty and colourful; but all who see it feel the stirrings of fear, even when they are filled with delight, for there is something wild and unfathomable about it. To witness the passing of the train is to be altered by it. Sometimes the changes are small: a man might hear the train at night and in the morning find that he has become a woman, or a woman might find herself transformed into a man; sinners may become saints, poets may become warriors. At other times the changes may be greater: you may wake up one night and hear the train rumbling past where no tracks were ever laid, and find yourself filled with an impossible urgency that will utterly transform all you have ever been; or you may simply know, without fully understanding why, that you cannot go on as you have before. And thus all those who witnessed its coming into our world were transformed, being closer to it than any have been since; and they were overcome by a sudden revulsion for all that they had done, and an abiding hatred of war. They laid down their arms and refused the orders of their superiors, choosing instead to rebuild the city; and that was the first step towards peace. 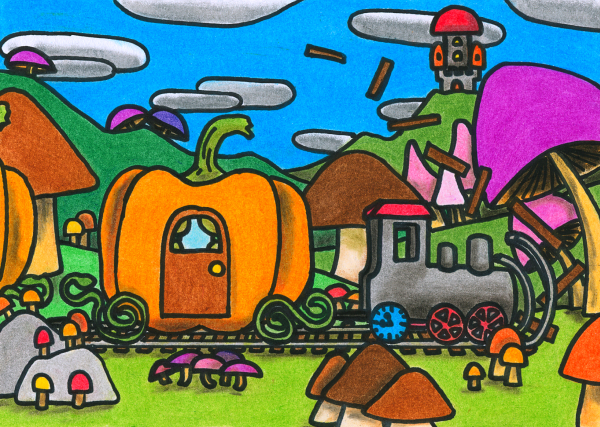 Though they fear to see it again, the people of Billion Toad City give thanks to the train. The train, they say, brings truth disguised as terror, enlightenment disguised as delight. They also say, and it is sometimes hard to tell how the saying is meant: perhaps one day it will drive past your house. This entry in the Oneiropolis Compendium was made possible by Robert Hinderliter.